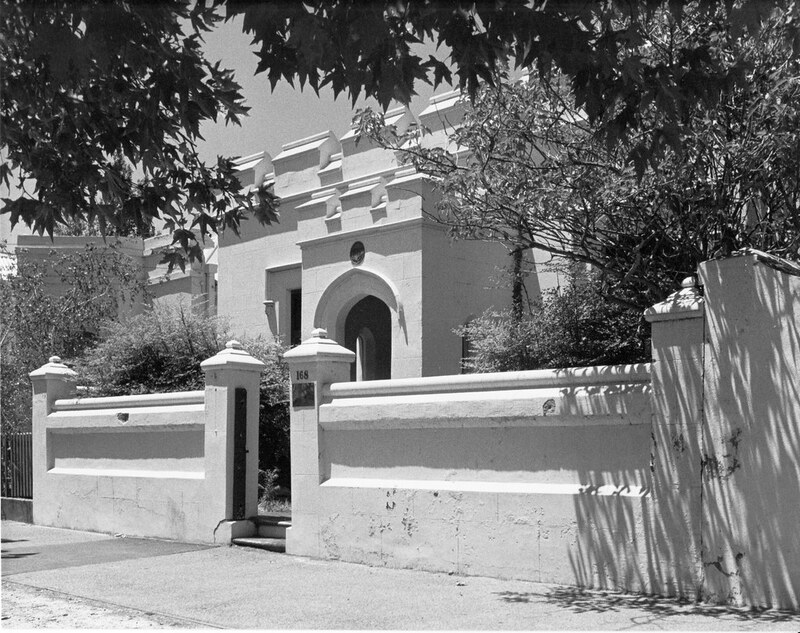 Described in 1935 as one of Adelaide’s ‘quaintest’ houses, the design of this building has been confidently attributed to the architect George Strickland Kingston. Certainly the elaborate Gothic inspired detailing and crenellation is evidence of an informed hand, but there is significant doubt as to the involvement of any architect with the design. The cottage was built by Samuel Saint, a plasterer. Saint with his wife and six children arrived in the colony in 1849 and bought the property on which the cottage was built in 1851. The assessment records for that year show Saint as occupying a two room stone house with lean-to in Gover Street, but by 1853 Saint was recorded as occupying a house in Jeffcott Street. However, assessment surveyed in late 1856 shows that Saint had occupied a house in Gover Street for six years while a house facing Jeffcott Street had been occupied by Saint for only one month. As this assessment is the earliest accurate survey of the area, it is most likely that the cottage was built in 1856. The attribution of the design of the cottage to Kingston may be considered specious as the building is simply an embellished version of the typical double fronted raised gabled-ended cottage commonly found throughout South Australia. In addition, Saint was a plasterer and so was capable of creating the moulding and details specific to this cottage. This casts further doubt on the involvement of any architect in the design. The Misses Saint explained in an article in the Advertiser, 28 September 1935 that their grandfather (Samuel Saint) had lived in a similar house near Windsor Castle and that on arrival in South Australia, ‘ . . . he built one as nearly like the old one as possible’. Although the slate roof cladding has been replaced by corrugated iron and the front wall has had its chamfer-edged interstices filled, the external appearance of the cottage remains largely original. It is therefore a potent reminder of the colonist’s provision not just of basic shelter, but the incorporation of symbolic association with the ‘mother country’. It is an important record of the achievements of run and cast plaster detail of the 1850s, the hood moulds, terminations, crenellated parapet and porch all echoing elements which could have been selected from architectural pattern books of the day. The consistency of approach is notable, for even the window subdivision echoes the transoms and mullions to be found in Gothic architectural precedent. This building, although not a major streetscape element, reinforces the small-scale residential character of the northern part of Jeffcott Street. A National Trust plaque was added to the building in 1976 recognising its significance. Do you have a comment to share? You may upload images that are no larger than 1MB, and to only jpeg, png, gif file types. I would point out that Samuel did not have a son William – his sons were Charles, Edwin and Samuel. I believe it belonged to Samuel jnr. My ancestor is Samuel’s eldest daughter Mary. Thanks Karen. Do you know any more about the house? This house always catches my eye on my way into work and I finally found its number! Amazing it has so much history. Such a pretty place. It sure is – North Adelaide makes for quite a picturesque commute.